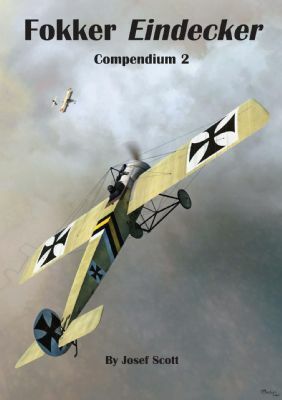 THE second volume of Josef Scott's highly-acclaimed Eindecker study covers the E.II,E.III and E.IV monoplanes in unprecedented detail.Each type is covered by hyper-accurate 1:48 scale colour and line drawings that reveal all aspects of the aeroplane; multiple archive photos of great clarity and additional colour profiles from Ronny Bar. The E.III comes in for special treatment with over 50 photos;1:48 scale drawings -extended to include full airframe structure- and there are also fine- line drawings of Oberursel U.I and U.III rotary engines as well as airscrew decals in full colour.The multi-gunned E.IV is similarly well covered with two pages of scale drawings,over three dozen archive images and a page of highly detailed 1:10 scale Spandau IMG 08 three views. Nine colour profiles adorn the inner and outer covers of this companion to Compendium 1 that together present the most authentic references ever published on the famed Fokker Eindeckers. Die erste Kannonen Fokker Eindecker set! Limited edition 1:48 scale Eindecker Dual Combo-two kits plus masks;PE parts;resin figures,portrait prints;five decal options and 18mm Iron Cross dress pin. Written by J M Bruce, this 1965 published Profile details the Fokker Eindeckers in 12 pages with colour profiles on the end papers.Clean copy with only minor wear.